Black Forest/Black Sea - "Radiant Symmetry"
Black Forest/Black Sea inhabit the nebulous realm that intersects free jazz, musique concrete, minimalist drone rock and contemporary avant-garde chamber music. On Radiant Symmetry the nucleus of Black Forest/Black Sea (cellist Miriam Goldberg and guitarist Jeffrey Alexander) are joined by a host of other musicians playing a variety of exotic instruments (bouzouki, tamboura, harmonium, for instance). All nine selections featured on Radiant were recorded live at various venues across Europe during the spring of 2004. 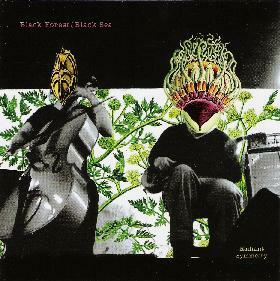 Most of the pieces achieve a kind of somber elegance often associated with contemporary chamber music, yet there are also moments of genuine improvisational anarchy, and the carefully constructed dissonances that burst volcanic-like from the deeper recesses of each piece confirm the suspicion that Goldberg and Alexander are sound deconstructionists of considerable talent. "Bristol 4/06/04" and "Tchai-Ovna Tearoom, Glasgow 4/20/04" are each notable for their ability to both becalm and disturb the listener simultaneously. The more ethnic strains of "Talbot Hotel, Stoke-on-Trent 4/11/04" represent a drastic shift in harmonic emphasis, moving from Western chronocentrism to a decidedly more Eastern conception of musical time as a continuum. Because of their commitment to such a holistic practice of sound composition, the pieces on Radiant Symmetry often achieve a brave though uneasy compromise between the sacred and the secular, not unlike that accomplished by Popol Vuh and Between throughout the 70s. Though not easy to digest at first, Radiant Symmetry amply repays the devoted connoisseur on repeated listening. For more information you can visit the Black Forest/Black Sea web site at: http://www.secreteye.org/b. Visit the Last Visible Dog web site at: http://lvd.4mg.com.